Honey-Can-Do HNGT01329 18-Pack Kid's Tubular Hangers, White. 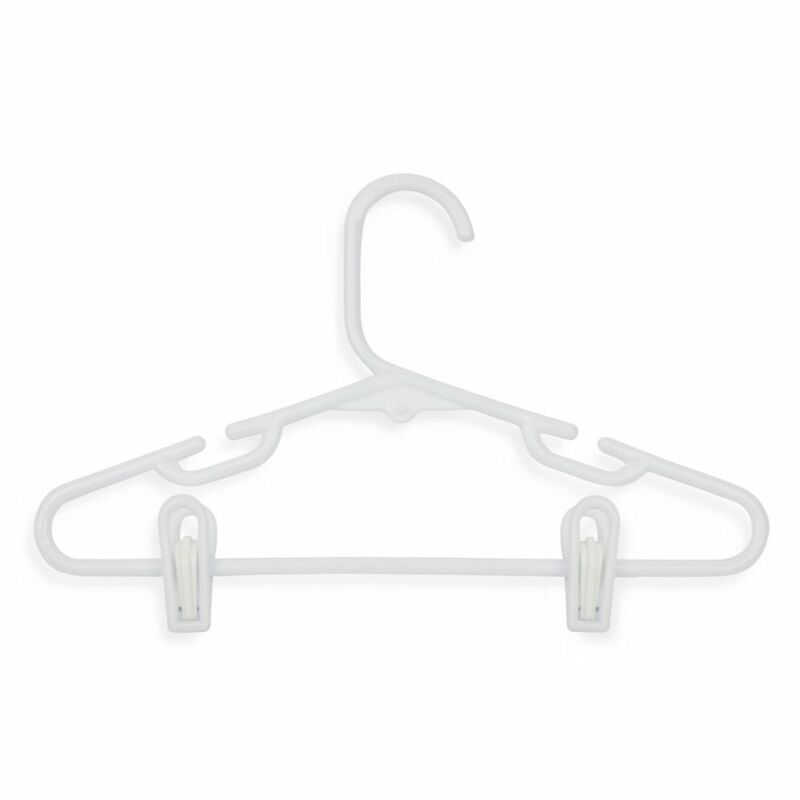 A must-have versatile, lightweight (26g) clothes hanger, perfect for child-size clothing in a convenient value pack. The large rod hook is designed to fit over any closet bar. Integrated accessory notches keep small dresses, tank tops, or even backpacks in place, plus hang belts nicely. Pant or skirt clips secure coordinating pieces together, simplifying your child's closet and your morning. A big help in the laundry room, these hangers are also great for air-drying clothes. Create more storage options in your home or office with the ClosetMaid White Stackable Storage Organizer. Its assembled dimensions of 31.5 in. H x 12 in. W x 11.5 in. D, as well as its ability to stack with multiple units, save you valuable floor space. You can combine it with other ClosetMaid accessories for a custom solution. The Everbilt 72 in. Oak Heavy-Duty Closet Pole is a strong, durable solution to traditional closet storage limitations. Constructed from finger-joined and edge-glued red oak, the pole is more warp- and sag-resistant than basic solid pine and fir dowel varieties. The red oak wood also takes a stain much better than pine or fir, allowing you to easily match with existing moulding and trim work in the closet. Supporting up to 500 lbs., the pole makes it easy to adjust and reposition hangers with its smooth, cylindrical design. 18-Pack Kid'S Tubular Hanger With Clips, White Honey-Can-Do HNGT01329 18-Pack Kid's Tubular Hangers, White. A must-have versatile, lightweight (26g) clothes hanger, perfect for child-size clothing in a convenient value pack. The large rod hook is designed to fit over any closet bar. Integrated accessory notches keep small dresses, tank tops, or even backpacks in place, plus hang belts nicely. Pant or skirt clips secure coordinating pieces together, simplifying your child's closet and your morning. A big help in the laundry room, these hangers are also great for air-drying clothes. 18-Pack Kid'S Tubular Hanger With Clips, White is rated 4.3 out of 5 by 6. Rated 3 out of 5 by FunWithFlags from These work ok but I don't know how long they... These work ok but I don't know how long they will last. The spring tension is plastic, not metal. Rated 3 out of 5 by geewhiz from Practicle for young kids we'll see how long they last. Pant clips sometimes fall apart, but can be put back together.. Needed this product to organize school clothes. The price was reasonable. Rated 5 out of 5 by Lisa from Works great I was looking for a way to keep my childrens tops and bottoms together and these hangers did the trick. They are sturdy and the clips grip well after much use. Other hanger clips which I have used did not grip as tightly. I like this product and would recommend it without hesitation. Rated 5 out of 5 by Tasha from Love the product. Love the product. It is exactly what I was looking for.